The City of Brussels is in a state of barely constrained panic, and with good reason. After lunch, Strange had used magic to observe the enemy, as he has been asked to do on a daily basis. The protective warding that hides the French Army’s location remains infuriatingly in place, and Strange would be using his time to find a way around it, if only he hadn’t been ordered to attend the Duchess of Richmond’s ball this evening. However, two things had been clear from the afternoon’s scrying: French troops are being deployed, and they are being deployed rapidly. Spirits at the ball are high but there is a nervous tension in the air. Strange feels it, like the rippling of magic, in whispered conversations and suppressed hilarity. Whatever the fallout of this war, it will be a sombre turning point in European history. To throw a party at such a time is to tempt fate, and they all know it. It occurs to Strange that if the enemy wanted to make short work of the British Army then this evening’s festivities would have been the perfect time and place to strike. Every officer that Strange can think of is in attendance at the ball. Indeed, the only man missing appears to be the Duke of Wellington himself. 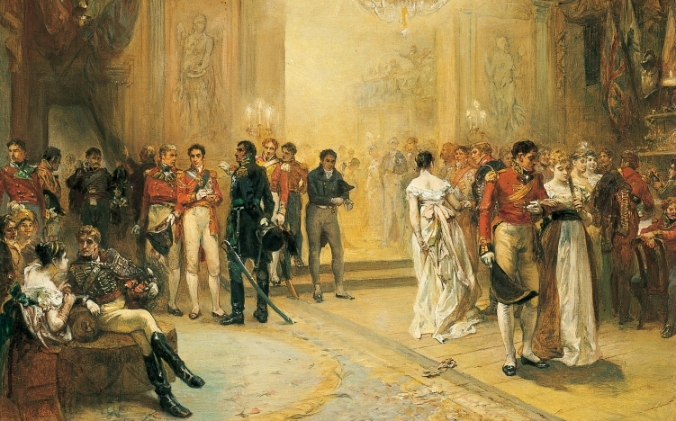 Summary: It is well after midnight and becoming rather un-fashionably late when The Duke of Wellington finally arrives. Strange shudders as he always does when Wellington makes an entrance, ever since their private interview at Maria del Porto.